We fish, we hunt, and maybe we just go for a swim now and again – however you may use your boat, the bottom line is that it should be fun. Last weekend I tried something new on my 14′ aluminum waterfowling skiff Feather Duster, which not only turned out to be a heck of a lot of fun, it also led to one of the best meals I’ve had in months: trot-lining. 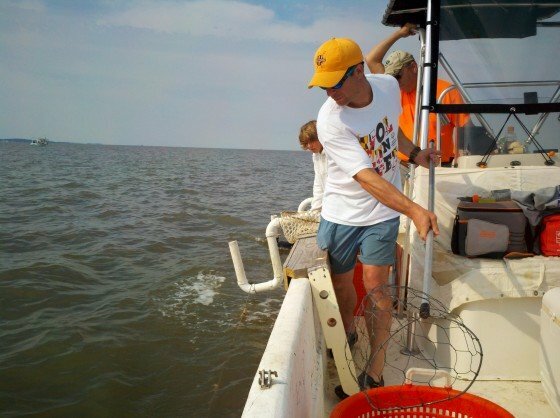 Trot-lining for crabs, that is – not for catfish. Unlike trot-lines used for cats a crabbing line has no hooks. Instead, it’s baited with chicken necks every few feet, and is weighted down at the ends. You drive along with the line laying in a “U” built of plastic pipe, which hangs off the gunwale of your boat. Creeping along at minimal speed, crabs hold onto the bait as the line rises. Just before the baits get pulled out of the water and run through the U, you scoop them with a net. I’ve seen other people run trot-lines for crabs but, since most of my sea-time is dedicated to fishing, hadn’t done it myself until a friend invited me along one day on his Carolina Skiff. I was shocked at how easy and simple it was, and we caught several dozen big crabs in a couple of hours. From this picture, you should be able to get a good idea of how it works. Thinking this might be a fun way to spend a day on the boat? All you need is a line (500′ or so is considered a small trot line), two floats, two anchors, and two pieces of chain. Tie an anchor to either end of the line, and put a float about 20′ from it. Then another 20′ down the line, tie on a piece of chain to keep the baited section of the line near the bottom. Oh yes, and you’ll also need five pounds or so of chicken necks. Tie a two or three inch chunk onto the line (use a slip knot for easy removal) every few feet. Once your line’s set, drive back to the beginning float, lift the line into your U-thingie, and begin putting as slowly as possible towards the end float. Keep a sharp eye on each bait as it rises up towards the U and when you see a keeper-sized crab, scoop away. Trust me, it is a heck of a lot of fun – especially if you like eating crab cakes!